Two Major League Baseball batting records were in play on Saturday, August 27th. As a side note this was the date 49 years ago that I married my lovely wife, Tara. Since I do not know the record for the longest marriage, I will return to something I do know about: baseball records. The two players connected with these records are the Yankee rookie catcher Gary Sanchez and the Red Sox veteran second baseman Dustin Pedroia. Wouldn’t you know it the 2 players come from the 2 teams that have always been bitter rivals. Pedroia entered Saturday’s games with 11 consecutive hits in 11 at-bats while Sanchez entered Saturday with 10 home runs in 22 games this season. Pedroia started his hitting streak on Thursday when in his last three at-bats against the Rays he had 3 hits. He followed that performance on Friday against KC with a 4-for-4 game and a walk. Going into Saturday’s game against KC he had a steak of seven straight hits in seven at-bats and a streak of eight times reaching base successfully in eight plate appearances. In his first four plate appearances on Saturday he got four more hits which extended his hitting streak to 11 hits in 11 at-bats and his on-base streak to 12 in 12 plate appearances. However, both streaks ended when he bounced into a double play in his last at-bat on Saturday. The last player to have 11 consecutive hits in 11 at-bats was the Yankee Bernie Williams who accomplished this streak in 2012. The Major League record for most consecutive at–bats with a hit is 12 and is shared by Johnny King (1902 Cubs), Pinky Higgins (1938 Red Sox) and Walt Dropo (1952 Tigers). The modern era Major League record for most consecutive times reaching base successfully is 16 held by a Red Sox player you might have heard of named Ted Williams in 1957. The breakdown of his 16 successes include 2 singles, 4 home runs, 9 walks and 1 HBP. The all-time record is 17 held by Frank Ward in 1893. 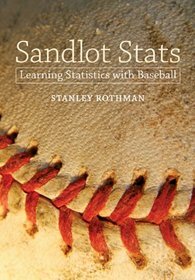 In Chapter 16 of my book “Sandlot Stats: Learning Baseball with Statistics,” I presented two mathematical formulas, one developed by Michael Freiman and the other developed by me, which use any player’s batting statistics to assign a probability of that player duplicating any batting streak. The mathematics used comes from the area of mathematics called probability. If interested, please read my Chapter 16 to see what these two formulas look like and the logic used to develop them. Using my formula, the probability of Pedroia having 11 hits in 11 at-bats was .0012 (this equates to 12 times in 10,000 seasons); his probability of having 12 hits in 12 at-bats was .0004 (this equates to 4 times in 10,000 seasons. The probability of Pedroia reaching base 12 times in 12 plate appearances was .0033 (this equates to 33 times in 10,000 seasons); the probability of Pedroia reaching base 16 times in 16 plate appearances was .0001 (this equates to 1 time in 10,000 seasons). How does this compare to the actual record-holders? Walt Dropo’s probability of setting his record of 12 consecutive hits in 12 at-bats was .0001 (this equates to 1 time in 10,000 seasons); while Pinky Higgins’s probability of 12 hits in 12 at-bats was .0002 (this equates to 2 in 10,000 seasons). Ted Williams’ probability of his record of reaching base 16 consecutive times was .0083 (this equates to 83 times in 10,000 seasons). The very small probabilities associated with all the record holders achieving their records shows that chance and luck is a very big factor in attaining these records. The year Walt Dropo set his record his batting average was a very mediocre .279. As for Gary Sanchez, with his home run Saturday against the Baltimore Orioles, he became the fastest player to reach 11 career home runs, doing so in just 23 games. My next blog will discuss all the other batting records approached by Sanchez in his rookie year. Hi Stan, Pedroia started the game, with my daughters and grandson in the stand, at 7 for 7, and got four more hits in his first four at-bats. His attempt at the record occurred (unsuccessfully) in the ninth inning. Glad you were able to see the end.